What is the Pelandaba Orphans Charity? 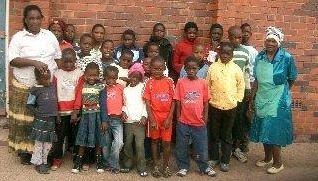 The sole aim of this small charity, which is based in Scotland, is to raise funds for the purpose of paying both the primary and secondary school fees of orphans living in and around Pelandaba, a suburb of Bulawayo, Zimbabwe. School fees are currently from £90 per term for primary school children depending on class stage and school and £120 -£150 per term for secondary pupils depending on class, school and whether they are sitting exams, either O Grade or A Grade, English Examinations. The Fund operates under the umbrella of the larger UK based Charity ZANE (Zimbabwe - A National Emergency) which was set up by the MP Tom Benyon in 2002. In 2011, Cindy Macdonald (a retired headteacher of a small primary school in rural Argyll), who was born and educated in Zimbabwe, was visiting friends who were involved in the support of a ZANE feeding programme for the elderly in Bulawayo, Zimbabwe's second largest city. Whilst visiting a food venue, Cindy noticed that even during school hours there were children using the feeding station and discovered they were orphans who had no means of affording school fees. In discussion with local ZANE supporters, she decided that on returning to Scotland she would try to raise funds for school fees. Several fund raising events have been organised over the years, both locally and with the assistance of her ex pupils. By December 2015, 45 pupils have been returned to school in Pelandaba, but there are many more in need of assistance, so Cindy is trying to increase the fund raising. There is a limit to what can be raised in a small rural area as there are so many worthy causes, hence the need for expansion. There are still many orphans in the Pelandaba area alone who are not receiving support - this web site is just one of the new initiatives.